Because DCC provided complimentary admission, I made sure the timely writing about the event was posted to GeekMom first back in June, but I figured I’d summarize all the posts here and then share the full photo album. The Denver Comic Con “Storify”. Storify is a website with which you can stitch together information from various instant social media outlets to summarize one’s experience. I used a Storify to put together all the Tweets I had sent that were shared on my own and GeekMom’s feed. Denver Comic Con Family Cosplay. This was a summary of the fun family-themed costumes at DCC. I remember seeing only our family and a Harry Potter-themed family group at Dragon*Con in 2012. At DCC there were dozens upon dozens of families. DCC’s Animaniacs Sing-Along. Boy was this fun! We had introduced our sons to Wakko, Yakko, and Dot a few years ago and they were able to join in with the crowd as we sang some of our favorites, such as the “Alphabet Song” and the theme from Animaniacs. Interview with DC Comics Writers Jimmy Palmiotti & Amanda Conner. The authors of the DC Comics Harley Quinn reboot are one of the most darling couples in the comic book industry right now, and I had a great time learning more about their imaginative ideas behind both Harley Quinn and the newly-reimagined Starfire. There were scores of Harley Quinn cosplayers and I captured several for a “Gang of Harleys” for this post. Interview with Gotham Academy’s Becky Cloonan. Gotham Academy is DC Comics young-adult series that offers a Harry Potter-esque story of students in a boarding school embarking in adventures that run in parallel to the classic DC Comics story arcs, such as in Batman. I’ll close with this photo album from our weekend. This is a combination of iPhone and Nikon photos. There aren’t any captions in the album at the moment, but I’ll add them in later this week. 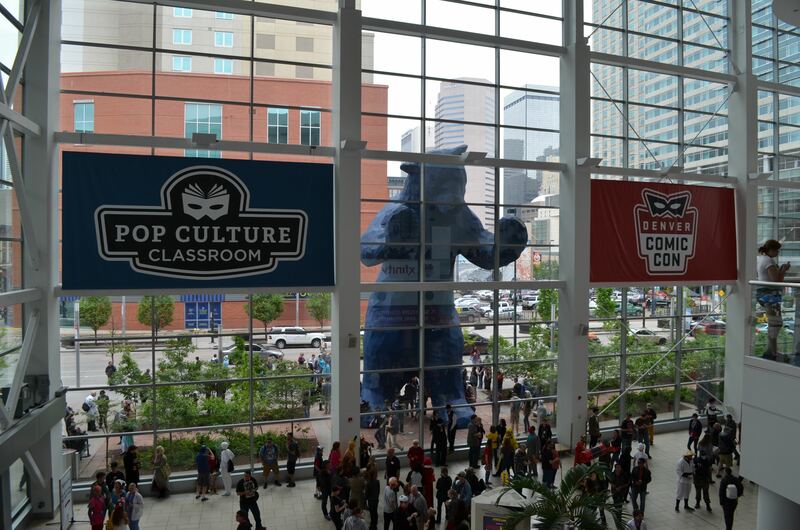 *Denver Comic Con is a program of the Pop Culture Classroom. Pop Culture Classroom (PCC) is a Denver-based education nonprofit that offers pop culture, core-aligned educational programs.